Some of Star Wars‘ greatest icons have arrived in Disney Emoji Blitz, the popular match-3 mobile game: Luke Skywalker and Princess Leia emojis make their debut, available via the Diamond Box, and the Darth Vader emoji is now unlockable thanks to a new Villain Event, running from November 29 to December 3. 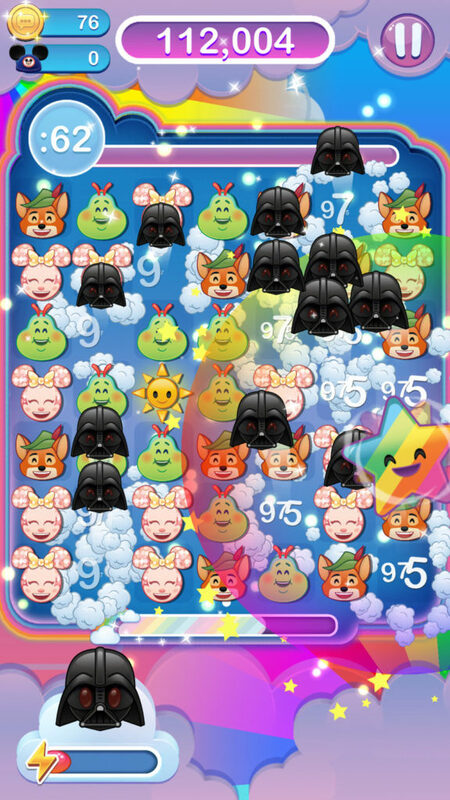 StarWars.com caught up with Ariana Crane, associate producer of Disney Emoji Blitz, to talk about adapting Vader into the game’s cute art style, how Leia’s ability reflects her character, and reflections on one year of Star Wars in Disney Emoji Blitz. StarWars.com: Thanks to the Darth Vader Villain Event, players will have the chance to win and use Darth Vader. From a gameplay perspective, why would you say he’s an emoji you’ll want in your collection? Ariana Crane: Darth Vader will be an awesome emoji to have in your collection because he uses the Force to grab emojis and throw them off the board. Plus, he always gives you a rainbow star, which is the best power up in the game. StarWars.com: What can you tell us about designing Darth Vader for Disney Emoji Blitz? I’m always impressed how the game adapts these iconic characters into its art style, and Vader is no exception — he’s so expressive! Ariana Crane: We are so glad you like it! With such an iconic character as Darth Vader, the team worked really hard to get all of the details just right. We spent a lot of time making sure the highlights were in the right places, and that there was enough contrast so that you can actually see his expressions. We wanted the Darth Vader emoji to embody the look and feel of the original character, even as an emoji. StarWars.com: Luke and Leia are also making their Disney Emoji Blitz debuts. How did you go about coming up with their abilities? Ariana Crane: We wanted Leia’s power to demonstrate an aspirational part of her persona, and being a strong commander was top of mind for our team. A tap-to-clear ability where she orders X-wings to destroy TIE fighters was the perfect abstraction of commanding in our game. Since Leia’s power focuses on the rebel fleet, and Darth Vader’s power focuses on using the Force to hold and throw emojis, it felt like the right mix of overlap and variety to have Luke’s power focus on using the Force, like his father, but with a lightsaber concept. The training remote scene where Luke first learns to use his lightsaber was the perfect fit, and we thought it would be super cool if the player got to feel like they were using the Force by tapping in advance of where the training remote would fire. This was also an opportunity to show Luke’s character arc over time as he deflects stormtrooper blaster shots in later levels. StarWars.com: Star Wars has now been part of Disney Emoji Blitz for just over a year. 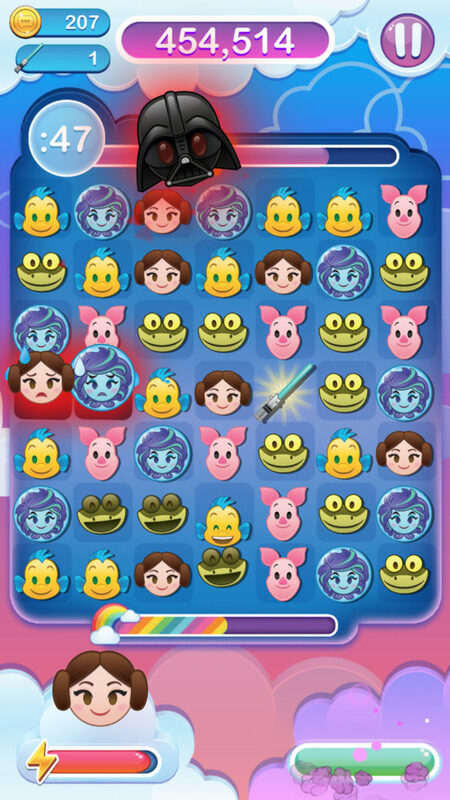 As game creators, what have you enjoyed most about being able to incorporate the galaxy far, far away into Disney Emoji Blitz? Ariana Crane: The Star Wars universe offers us so much to work with, it’s hard to pick just one. From epic character moments to the iconic music, it’s been so much fun to give these elements an emoji twist. We love bringing in characters that are nostalgic for some of our existing players and brand new to others. An exciting challenge that we have is abstracting the rich back stories from the characters, into super-fast power up abilities that resonate with Star Wars fans. Seeing our Blitzers’ positive reactions to Star Wars emojis in the game is the best! They were so excited when we first introduced Rey, Finn, BB-8, and Kylo Ren, and the team can’t wait to see how everyone reacts to Luke, Leia and Darth Vader. We’ve really enjoyed making the Darth Vader Villain Event come to life and are so excited for our fans to play with these beloved classic characters. Disney Emoji Blitz is available now.